Wait, You're Supposed To Wash Your Water Bottle HOW Often? Drinking lots of water during the day is good for you. And keeping a reusable bottle on you at all times is an excellent reminder that you should be drinking throughout the day. Saving the environment and doing something nice for your body? You go, Glen Coco. But don’t pat yourself on the back just yet. If you’re like us, you probably haven’t cleaned your water bottle in... a while. And by a while we mean weeks. And by weeks we mean months. Hate to break it to you, but you really should be washing your water bottle every. single. day. We know what you’re thinking: “But I only fill it with water!” It doesn’t matter, folks. This applies whether you’re using a plastic, glass or metal bottles. “Ideally, it is a good idea to clean your water bottle at the end of each day,” says Eric Hansen, the Director at Nalgene Outdoors. The ever-popular S’well Bottles also recommend daily cleaning, too. The same applies for glass bottles like bkr. If you’re looking at your water bottle right now and trying to remember the last time you washed it, fear not. Just give it a thorough wash as soon as possible. 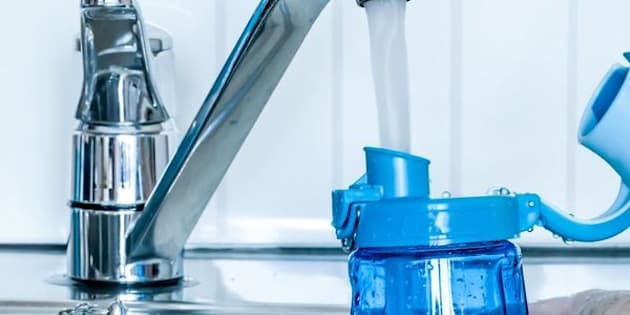 You only have to toss your water bottle if it “appears to be degrading in some way―peeling, seal isn’t tight, rusting, melting, etc,” says Franke. Oh, and just so we’re clear. Cleaning your water bottle doesn’t mean just rinsing it with... more water. “You’ll want to use soap and hot water to get rid of germs,” Forté says. “And pay special attention to the nooks and crannies in the cap. Germs have been found in these caps even after washing if they aren’t washed thoroughly enough.” Awesome. When it comes to cleaning your trusty water bottle, PopSugar has a few suggestions. First and foremost, you can clean it simply with soap and warm water as Forté suggested. Alternatively ― depending on the brand of bottle you have ― you can put your bottle in the dish washer. Just make sure it won’t get ruined in the process. Or, you can DIY the situation by using vinegar’s natural disinfectant qualities to clean your bottle. Just fill half of your bottle up with white vinegar, fill up the other half with water, let it sit over night, and thoroughly rinse in the morning.